NOORSOFT | How to Register & Activate the Program? How to Register & Activate the Program? Thank you for your good choice in selecting a Noor Software Program. In order to register and activate it please read the following instructions carefully. After you install any of Noor Software Programs an activation window opens. In case you have an Internet connection and want to activate the Program through the Internet, simply select the first option; otherwise, select the second option (in this case you can activate your program through SMS, an Answer Phone, or email). However, we suggest you the activation through the Internet. In case you have selected Activation through the Internet, kindly connect to the Internet; fill in the personal information form and then click OK. An activation Code will automatically be downloaded from the CRCIS website and the Program will run. To register the Program the Serial Number of the Program (available in the Program package) is required. Please note that it is compulsory to fill the asterisked boxes. The email address must properly and fully be written. It is worth mentioning that the information you insert into this form will remain confidential. 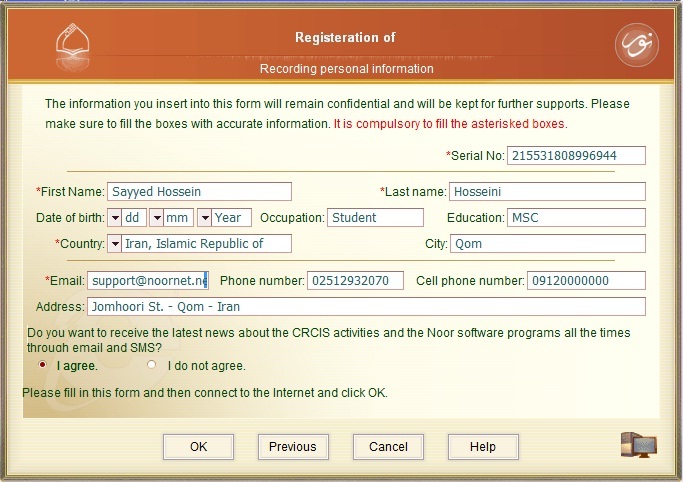 If you want to receive the latest news about the CRCIS activities and the Noor software programs all the times through email and SMS, simply select “I agree” at the bottom of this form. One of the options at your disposal in software program activation is submitting comments. 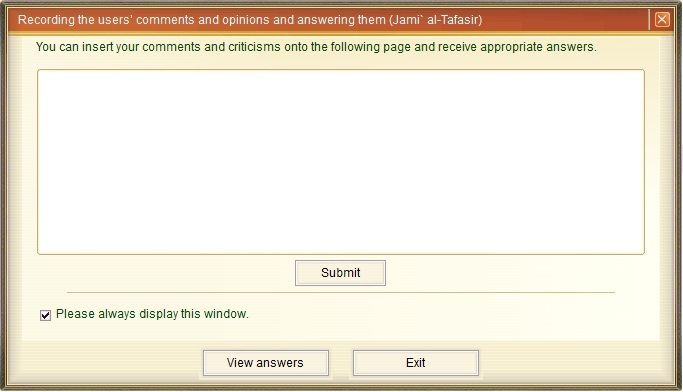 After activating the Program and subsequent to running it the Comments window will open in which you can write your suggestions and criticisms, and submit them. In case you want to read the reply to your comment simply click “View replies”. In case you have already cleared the checkbox of “Always display this window” and now you want otherwise, simply go to “Options” and select “Restore defaults”. In case you select “I do not have access to the Internet through my personal computer”, the above window will open. 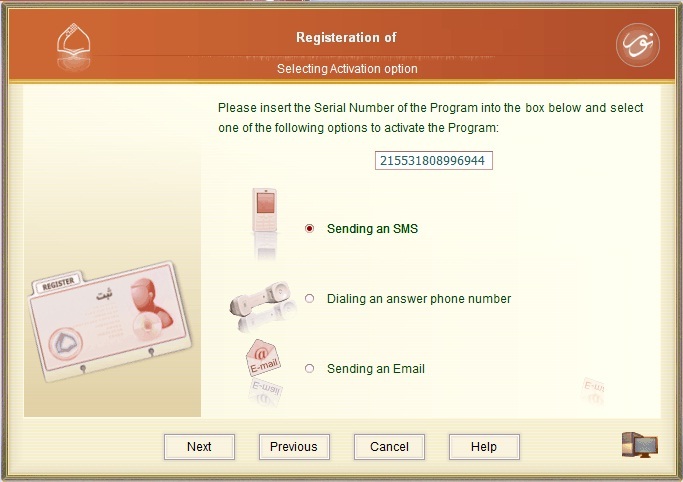 After you have inserted the Serial Number of the Program (offered within the Program package), you can activate the Program in one of the three methods: SMS, Answer phone, and email. Select an option to view the next step. 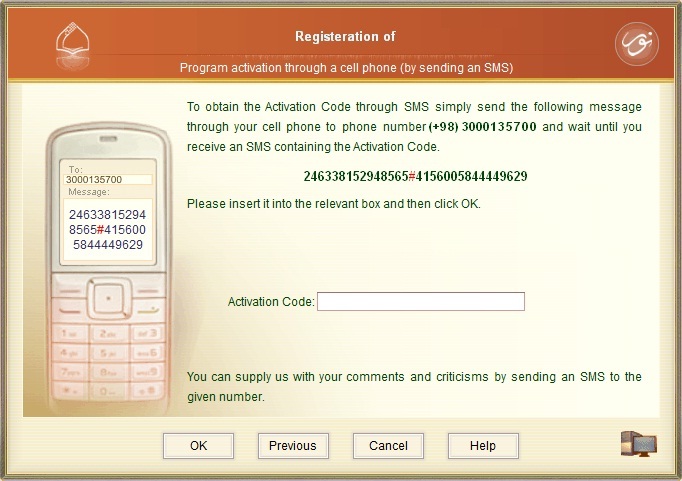 One way to obtain the Activation Code is making use of a cell phone and sending an SMS to phone number (+98) 3000135700. To do so please mention the Serial Number of the Program as well as the PC Number (given to you in the Activation Page) within the text of SMS and send it to the given SMS number. Please note that it is necessary to insert a # character between the two numbers (i.e. serial number and PC number). After you send the SMS, you will receive the Activation Code. Simply insert it into the given box and then click OK to run the Program. Please make sure to insert the numbers accurately; otherwise (in case the numbers are inserted wrongly) you will lose one of set up permissions of the Program. Please note that you can also send your suggestions and criticisms in an SMS to the very same SMS number. 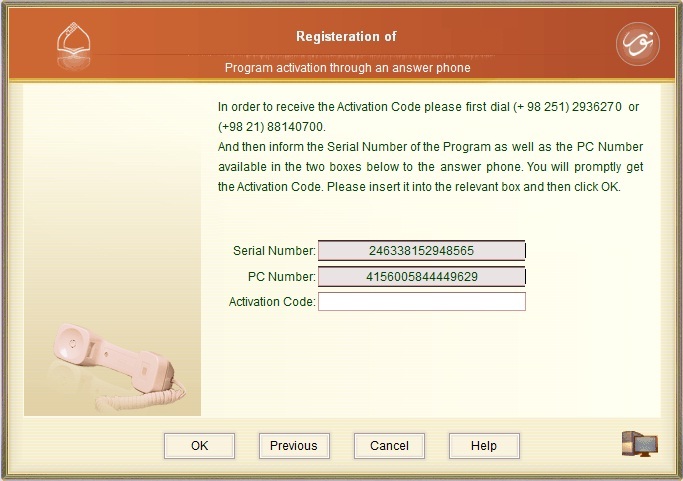 In case you have selected “Activation through an Answer phone”, kindly dial (+98 21) 88140700 or (+ 98 251) 2936270. And then inform the Serial Number of the Program as well as the PC number to the answer phone in the suggested procedure. You will shortly get the Activation Code. Please write it down accurately and insert it into the relevant box and then click OK. Please make sure to insert the numbers (i.e. serial number and PC number) accurately; otherwise (in case the numbers are inserted wrongly) you will lose one of set up permissions of the Program. 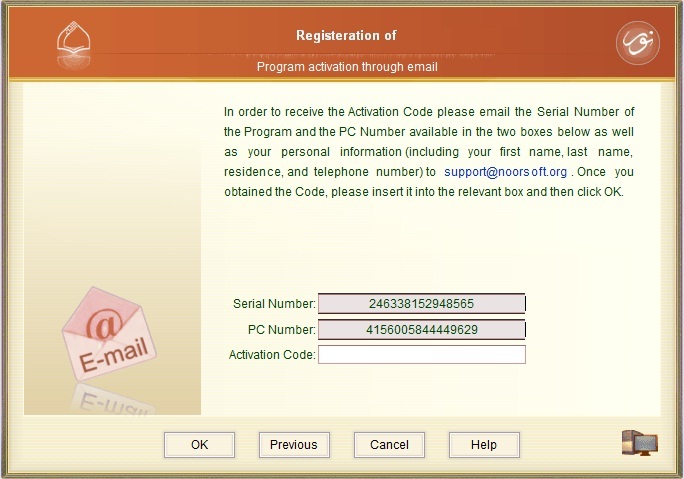 In order to receive the Activation Code in this way please email the Serial Number of the Program and the PC number as well as your personal information (including your first name, last name, residence, and contact number) to support@noorsoft.info by any computer through which you can send an email. Once you obtained the Activation Code, please insert it into the relevant box and then click OK. Note : In case you use several software programs developed by the CRCIS you can mention the PC number as well as the Serial Numbers of the programs in addition to the required personal information in one message and email it to the above address. Meanwhile, through this way you can email your comments and suggestions about the CRCIS activities and the Noor software programs. After you have activated a software program or a number of programs, the information related to program activation will be saved in a file called NoorData.Dat in a folder called “NoorRegister” in your C drive "C:NoorNoorRegister". It is recommended to create a backup of this file just in case. Any time you change your Operating System, or uninstall the Program and reinstall it, there will be no need to reactivate Noor Software Programs if you simply copy the backup file into its given path. Each time you install a new Noor software program, it is recommended to update this backup file. or Chat us through : Yahoo Messenger or Google Talk by using the ID Noorprograms.